The Super 8 of Ithaca at 400 South Meadow Street announced today that Julie Swigart, General Manager has been recognized with the GENERAL MANAGER OF THE YEAR AWARD by the Wyndham Hotel Group. This award recognizes outstanding performance of a general manager, one that goes above and beyond the call of duty. 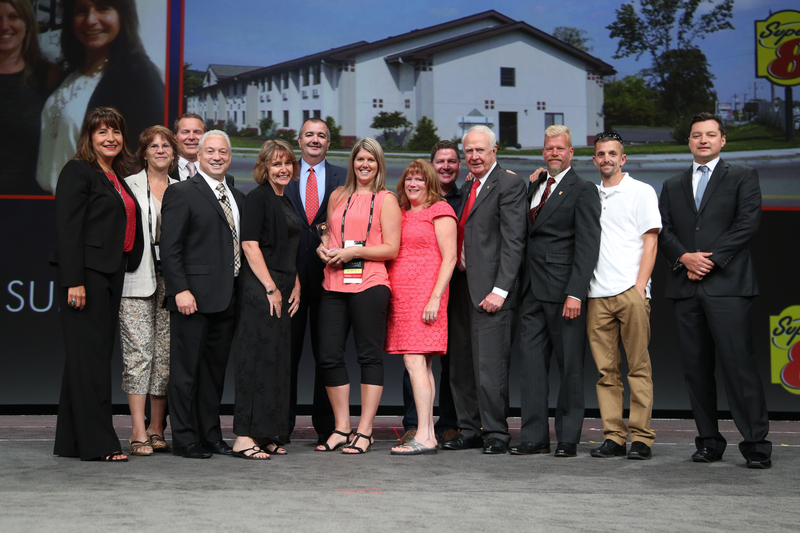 In celebration, Swigart was presented the award by Super 8 and Wyndham Hotel Group leadership at the 2016 Wyndham Hotel Group Global Conference in Las Vegas before an audience of more than 6,000 hoteliers. There are over 2,700 Super 8 motels located around the world. “This is a great honor for our hotel and a direct result of the hard work of our wonderful staff,” said F. Edward Devitt, the owner. Julie takes pride in assisting the local food shelter by serving meals to the homeless at Loaves and Fishes of Tompkins County at St. John’s Episcopal Church. She enjoys being able to give back to the hotels local community, while helping those in need. To do so, Julie regularly donates clothes to the local Salvation Army and American Red Cross. Julie works with the Hotel and Restaurant program at the local community college by mentoring students and attending job fair days to offer her experiences in the hotel industry to help prepare students to enter the world of hospitality. She is constantly looking for ways to market and improve our hotel to meet the ever changing standards of the hotel industry and to beat out our competitors resulting in increased revenue, occupancy and ADR year after year. Her efforts are reflected in the awards she has achieved such as the 2015 Pride of Super 8 and the 2015 Trip Advisor Certificate of Excellence Award. Julie has been a part of the Super 8 Ithaca team since 2009. She began her career with us as a front desk clerk and worked her way up to General Manager within three years which is quite impressive. The Super 8 Motel of Ithaca is a 63 room motel and offers a complimentary breakfast, flat-screen televisions, refrigerators, microwaves and complimentary Wi-Fi.